It’s hard to believe that another month has passed! We are pleased to have been featured in so many great publications through out March. Borrowed & Blue has recently done a spotlight on us and it features some great questions and answers. We are very honored to have been featured. Thanks Borrowed & Blue! You can read our spotlight here. I Love Farm Weddings featured Chelsea and Hunter’s gorgeous backyard wedding here. Borrowed & Blue featured Stephanie’s downtown bridal session. We really love this one. We started out at Charleston’s famous battery and then moved inside to the Governor’s House Inn. You can see the feature here. A Lowcountry Wedding featured Keesha and Rob’s engagement session here. 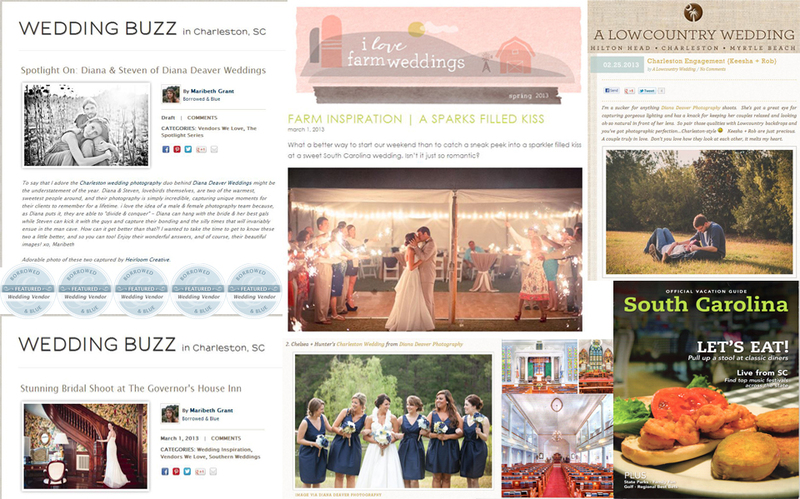 Finally, we are very pleased that A Lowcountry Wedding included Hunter and Chelsea’s wedding in their Top 10 Lowcountry Weddings of 2012! In addition to our wedding features, Steven had some of his photos from The Churches of America Project featured in the latest South Carolina Vacation guide.